Storks are mentioned in 5 verses in the Bible; Leviticus 11:19, Deuteronomy 14:18, Psalms 104:17, Jeremiah 8:7 and Zechariah 5:9. Storks are large, long-legged, long-necked wading birds with long, stout bills. They belong to the family Ciconiidae. They are the only family in the biological order Ciconiiformes, which was once much larger and held a number of families. Storks occur in many regions of the world and tend to live in drier habitats than the related herons, spoonbills and ibises; they also lack the powder down that those groups use to clean off fish slime. Storks have no syrinx and are mute, giving no call; bill-clattering is an important mode of stork communication at the nest. Many species are migratory. 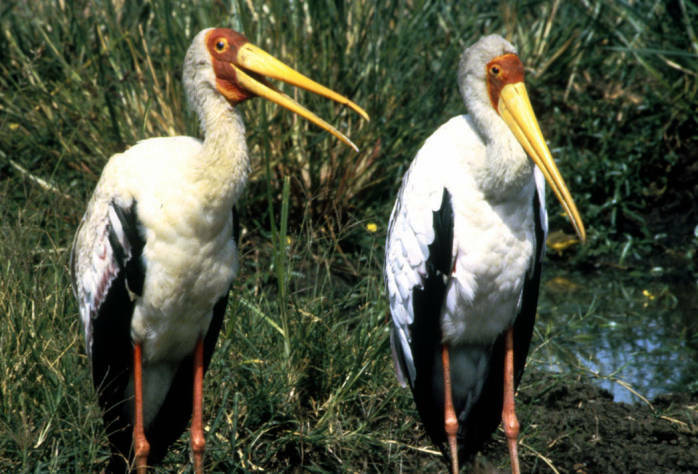 Most storks eat frogs, fish, insects, earthworms, small birds and small mammals. There are 19 living species of storks.